I love this recipe for two reasons. One is because I usually have all of these ingredients in my cupboards already. 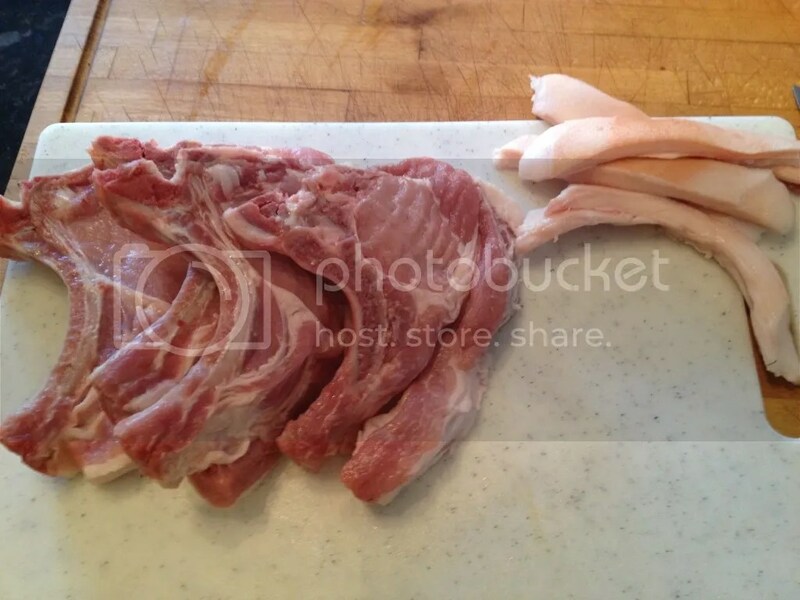 The other is because it keeps the pork moist and flavorful. 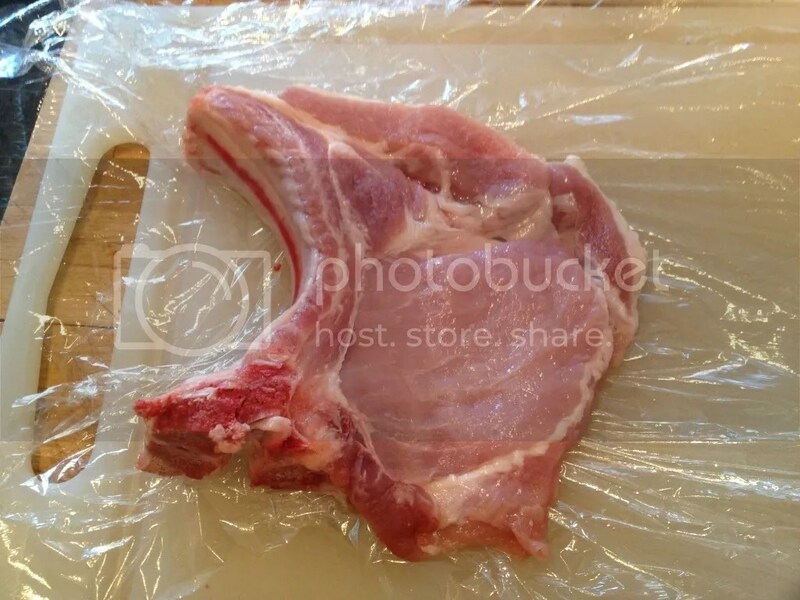 The original recipe calls for pork chops with the bone attached but I’ve made this without the bone and I must say it makes everything a lot easier. We had a rare sunny day here and Layla and I went to the Southbank to meet Tim for lunch. We had a beautiful picnic on the lawn of the Tate Modern overlooking the Thames and it was perfect! 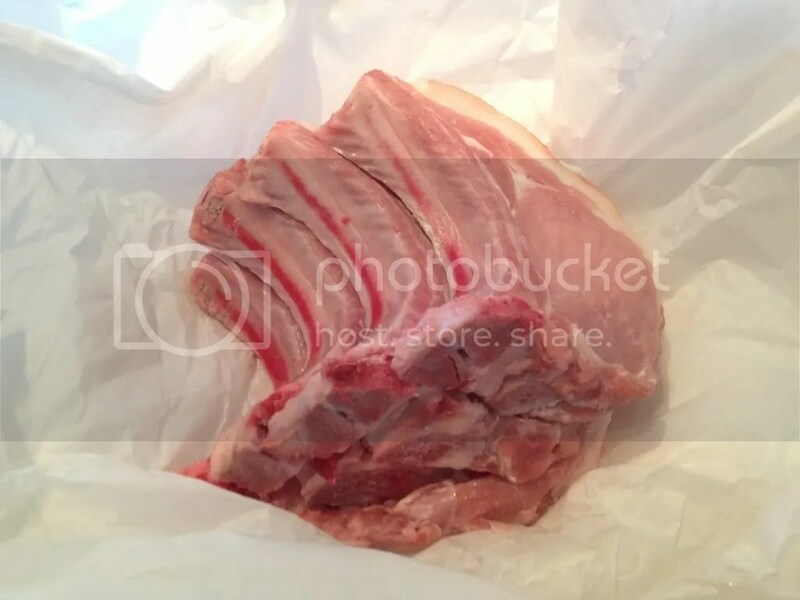 Afterwards we wandered down the river past The Globe to Borough Market where I bought these gorgeous thick pork chops. 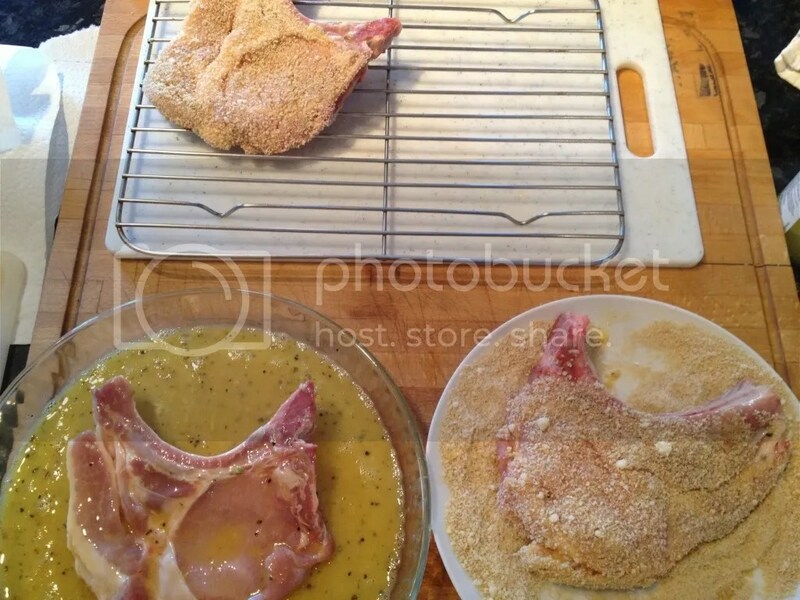 The best way to show these chops respect was to make sure I kept them moist and simple. 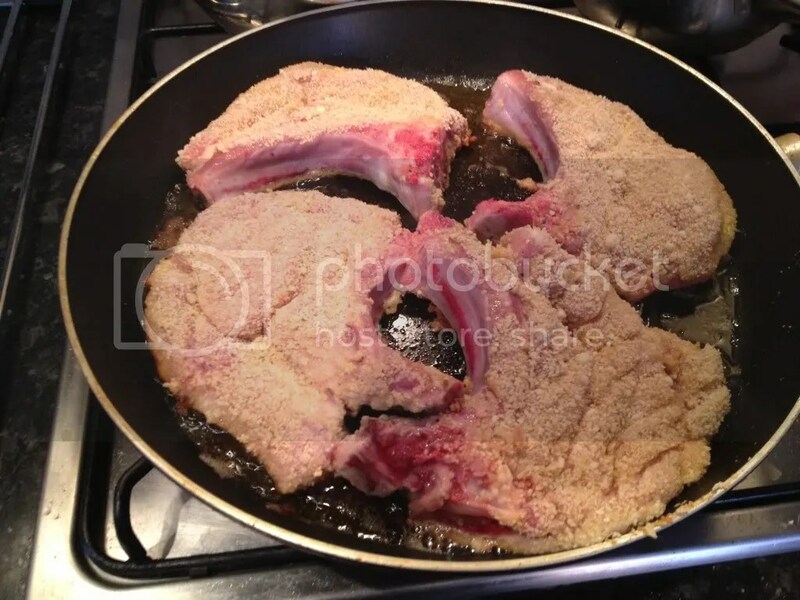 These Crunchy Pork Chops are an adaptation of the Nigella Lawson classic and I can’t recommend them enough. Basically, it is a Shake n Bake cheat. Also, goes great with a good squirt of lemon on top! I apologise for the final photograph of the dish. We had already started tucking into the food when I realised I hadn’t taken a picture. It just smelled so good! The only chop I had left looked a bit more well done than the others. I’ll try and take a better picture next time. 1. 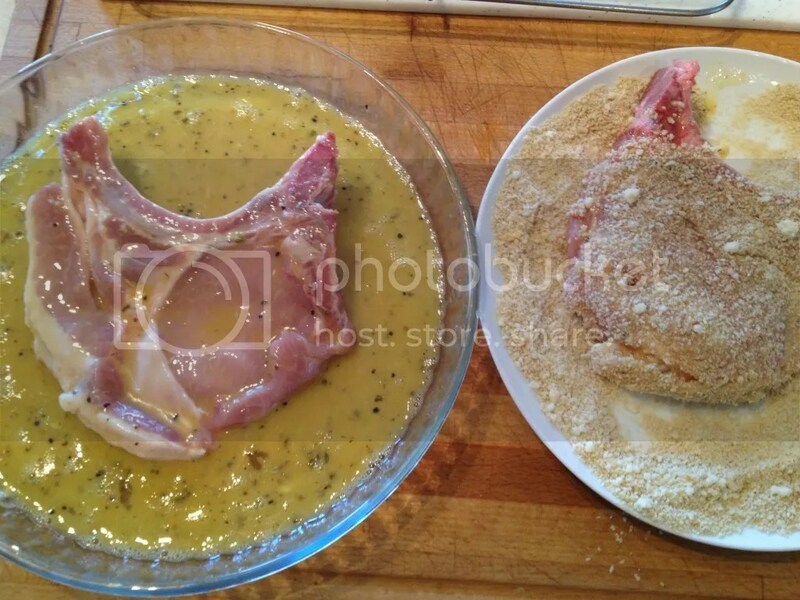 Trip the fat from your pork chops. 2. 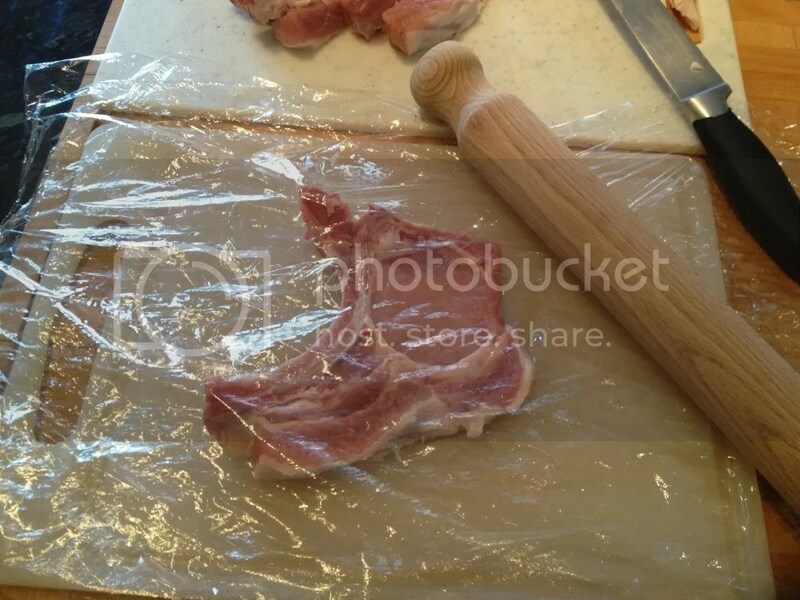 Place one of your chops between two sheets of plastic wrap and beat with a meat mallet or rolling pin until about 1/2 inch thick. 3. 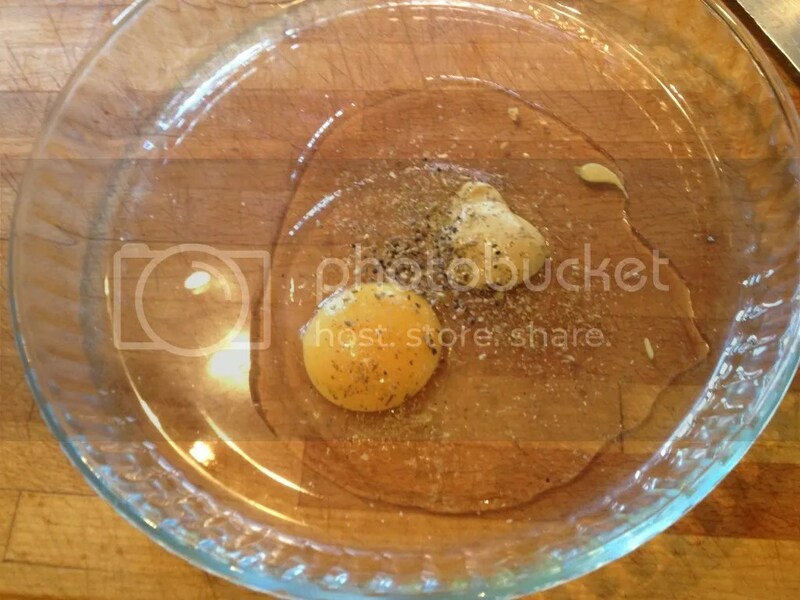 Beat together the egg, oregano, salt and pepper in a wide shallow bowl. 4. 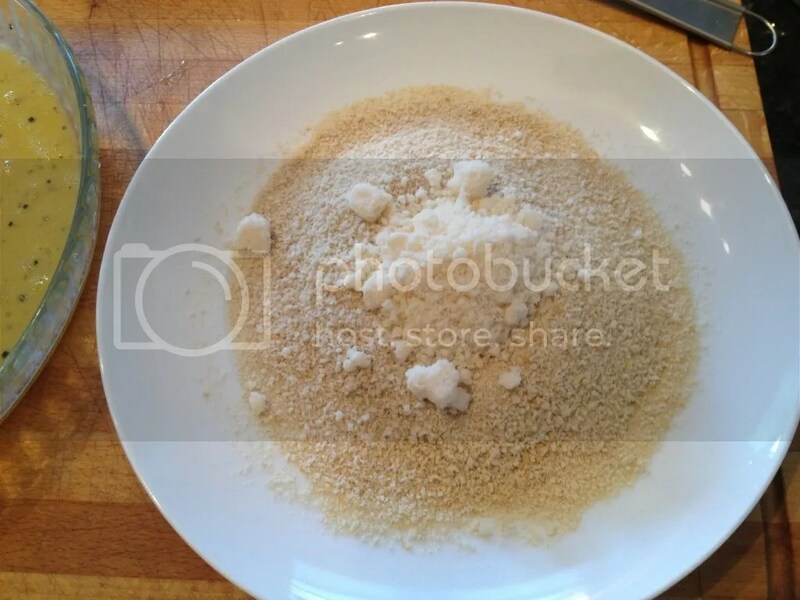 Mix the breadcrumbs and parmesan together on a separate plate. 5. 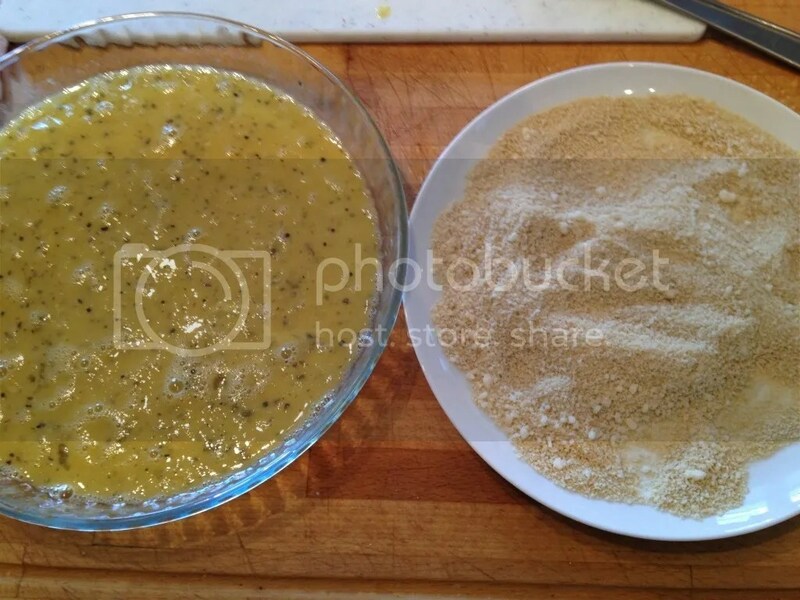 Coat each chop in the egg mixture on both side and then do the same with the breadcrumb mixture. 6. 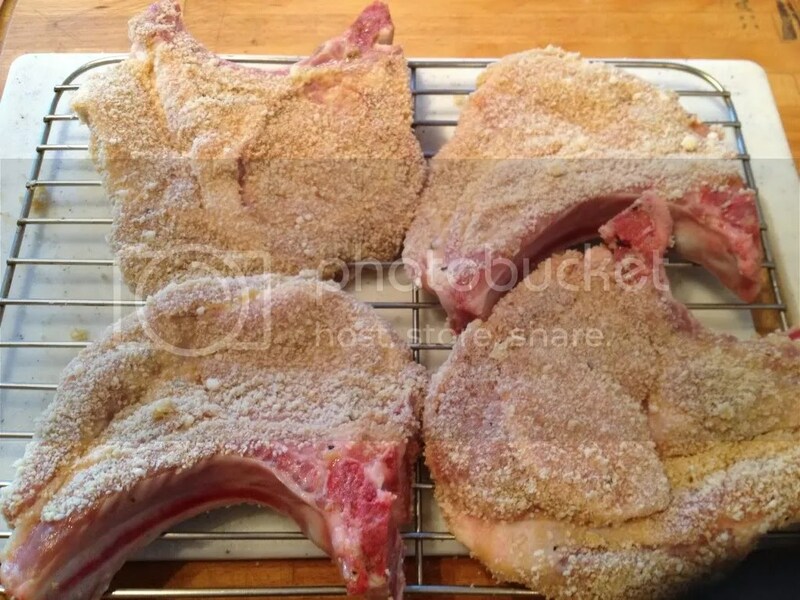 Place the chops on a rack to dry slightly while you prepare the pan. 7. 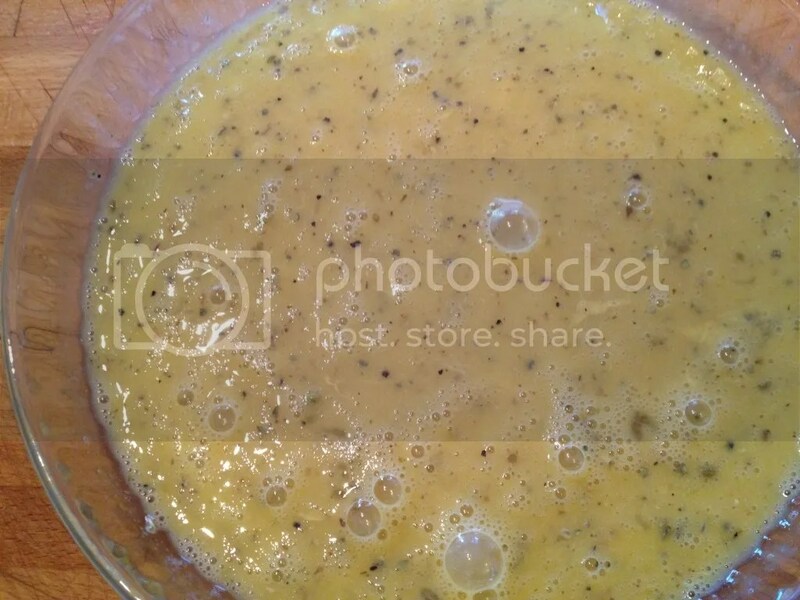 Pour 2 tablespoons of oil in a large skillet or frying pan on medium-high heat. 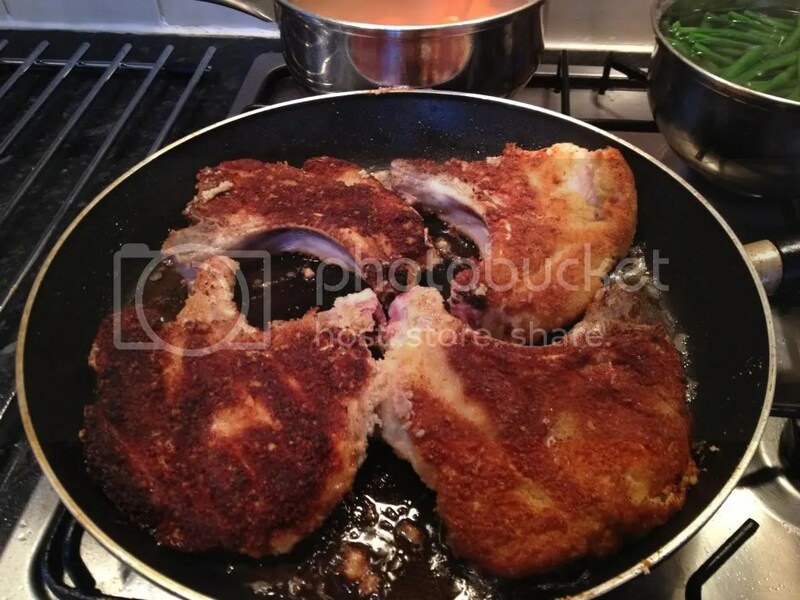 Fry the chops for about 4-5 minutes on each side. 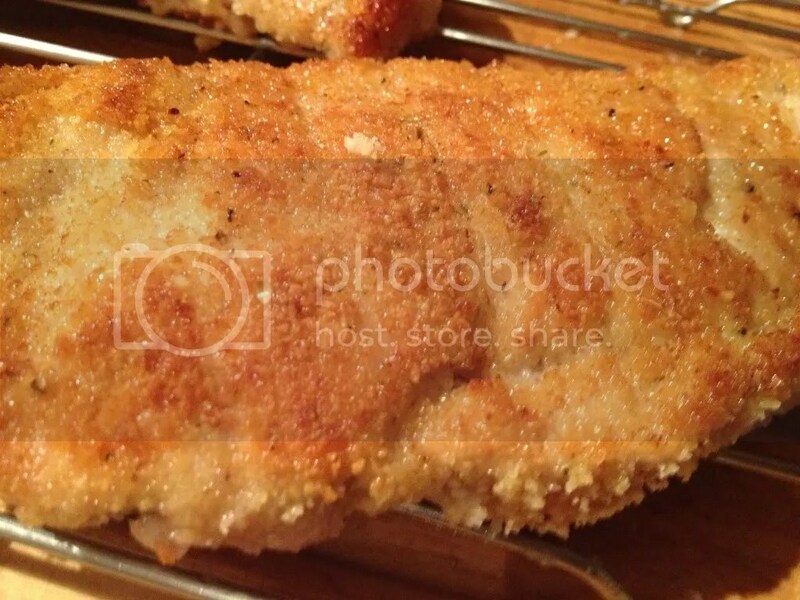 They should be golden brown on each side and cooked through. 8. Serve with some simple vegetables and a squirt of lemon. Enjoy! 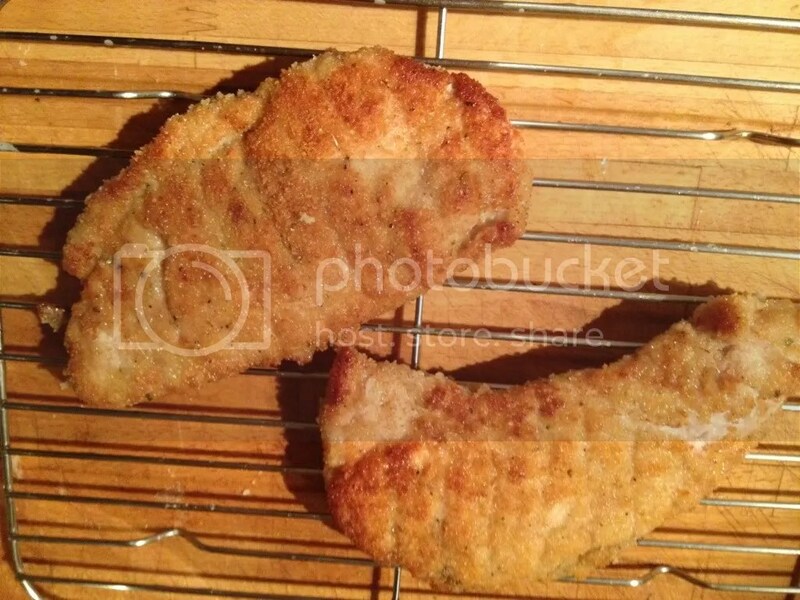 Same recipe but with pork escalopes. No bones no fuss.